These bars are great for a crowd. Baked in a sheet pan you get enough to feed that banana loving crowd of yours! In an attempt to wean myself off of my current Peanut Butter Crinkle Cookie obsession, I made Banana Bars. For some reason it made sense to me to make something that I didn’t crave. 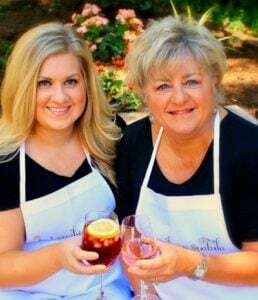 It’s like ordering bourbon when you want wine so you don’t drink too much. But really, all that happens is you end up loving bourbon. Same concept here. Now I crave these Banana Bars (and bourbon)…I really am hopeless. Besides loving the incredible sugar rush I got from licking the frosting bowl, I also loved that this recipe is baked in a sheet pan. When I am not obsessing over Peanut Butter Crinkle cookies then I’m obsessing over new things to make on a sheet pan. It’s a hobby..a sheety one! Oh come on let me have one sheety joke! I love sheet pan cooking so much that I created a new Pinterest board just to house them and you can see that here. I have a few more recipes on sheet pans in the works. Still working on a salmon version that doesn’t look like sheet….Ha! Zing! Gotcha! Never gets old does it? Super easy recipe that I hope you will try! Only note is to make the frosting during the last 10 minutes of the bars baking so you can frost while the bars are warm! 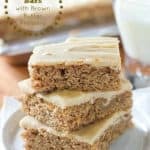 Banana bars that feed a crowd! These bars are baked on a sheet pan. The flavor is fabulous and the brown butter frosting is a perfect addition. Cream together butter and sugar using an electric mixer. Beat in eggs, bananas and vanilla. Combine flour, baking soda and salt. Add to the banana mixture and mix well. Bake at 350 degrees for 25 minutes or until lightly browned and springs back easily when touched. About 10 minutes before bars are done. Begin the frosting: Melt butter in a large saucepan over medium heat until boiling. Continue boiling for about 3-5 minutes until the butter becomes a light brown. Remove from heat. Add powdered sugar, vanilla extract and milk. Whisk together until smooth. You will want this a bit thinner than frosting so it spread easily on the warm bars. 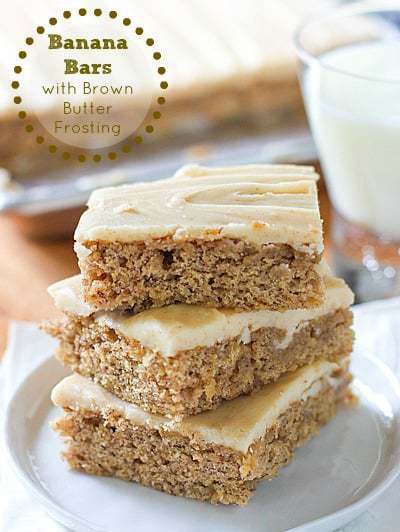 Using a spatula, spread the brown butter frosting over the warm bars.